Haitham Ibn Thbait, of the American chapter of Hizb Ut-Tahrir, recently exhorted American Muslims to avoid falling into the “electoral trap” and called upon them not to vote in the U.S. elections, saying that getting Muslims to vote was part of an effort to assimilate them and that they had been “tricked” into voting for Clinton, Bush, and Obama in the past. Speaking at the Khilafah 2016 conference, held in Chicago on May 15, Ibn Thbait further called Obama a “terrorist” and said that “Islam is here to dominate.” The address was posted on YouTube by Hizb Ut-Tahrir on May 20. Haitham Ibn Thbait: The Prophet said: “There is no god but Allah.” Instead the [elites of Mecca] rejected. They offered the Prophet wealth, status, and political representation – a seat on the executive branch within Mecca’s secular order – all to avoid this statement and its implications. Yet he rejected their offers and continued his journey towards radical change, providing us with step-by-step instructions on how to make this religion supreme. Crowd member: Say: There is no god but Allah! Crowd: There is no god but Allah! Haitham Ibn Thbait: There was no room for compromise. Instead Allah revealed to the Prophet, saying: “Proclaim openly, as commanded, and turn away from those who associate others with Allah.” “Proclaim openly, as commanded by Allah” – this is our activism. It is free of polytheism, the polytheism of a secular system. Activism within a flawed infidel system is forbidden. We have seen Obama in Cairo, and later in Baltimore, reinforcing what type of Islam is acceptable. Brothers and sisters, Obama is not an Islamic reference. He is a terrorist. He represents a system of terrorism. How dare we allow him to teach us what Islam is? Crowd member: Allah is our Lord, and the infidels have no lord. Crowd: Allah is our Lord, and the infidels have no lord. 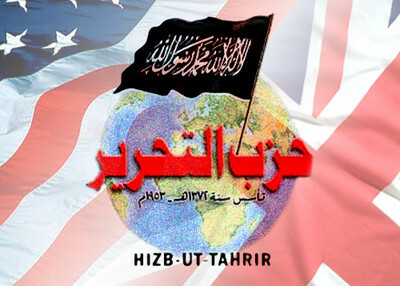 Hizb ut Tahrir also wrote the classic, Jihad (physical fighting for allah), The Highest Peak of Islam.